Two small islands in the center of the Red See is often referred to as The Brothers, or El Akhawein. These are two small islands, only a 5 minute boat ride apart, probably formed by volcanic action. The military is securing the larger Brother in a manned lighthouse. The scenery, the high likelihood of seeing sharks and many other marine life will make this a dive with fantastic experiences. Check the tour operators whether the Big Brothers are open to divers. They are periodically closed, and a 5 USD fee has to be paid per diver per day. 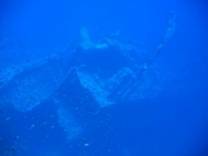 Hurghada has many dive operators who offer live-aboard tours to the two Brothers. Aqua Stars DivingThe best high quality live-aboard covering the Red Sea. From the North till into Sudan. Meet you some where in the Red Sea! German diving center in the heart of Hurghada. Since over 9 years, fair prices and best service.Privat jetty, own boats.....and much more...Daily diving and safaris in the red sea. The way liveaboard should be! We are offering luxury diving safari trips throughout the entire Egyptian Red Sea. Currently we are sailing 7 top class Motor Yachts. Curious - Please visit our website for more information!